Home / Lifestyle / Looking for Toronto Condos for Sale in 2018? Looking for Toronto Condos for Sale in 2018? The second half of 2017 saw the housing market plummet down steeply, but the condo prices soared up to 20% in 2017 and are still going strong. A massive chunk of new homes under construction constitute Condominiums, and they are high in demand since they still cost less than single family units. For many people, investing in a Condo is the closest that they can come to owning their own house in the competitive Toronto market, while for others, its more about convenience and the promise of hassle-free living. If you are looking for Toronto Condos for sale, here are some tips for buying a condo in 2018. Even in the same building, Pre-construction Toronto condos for Sale used to cost less than existing units. It doesn’t come as a surprise since buyers have to contend with the uncertainty surrounding final finishes and layouts and new build timelines, as well as have their investment sit with the developer for a long time before they get to see fruitful results. However, the current Condo market is witnessing a rise in the pre-construction prices, most times exceeding the prices of existing condos. We believe that under such circumstances, it is more prudent to own a unit that can be immediately put to use, in contrast to one that you have no use of until the building is finished. An existing condo translates to an immediate financial benefit for the buyer since it can be rented out or lived in as soon as it is purchased. Imagine the mountainous sum of money lost if you factor in the facts that a condo construction can often take along the lines of 4-5 years to finish and an average one-bedroom condo can go up for rent for as much as $2,000/month. 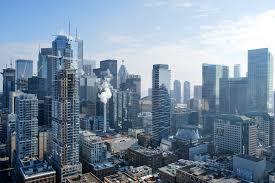 Investing in a resale condo sounds much better from a purely financial outlook that going for a pre-construction one. Most Toronto condos for sale constructed in the last decade see myriad condominium buildings sharing a common amenity space. This allows condo owners to revel in such comforts at a fraction of a cost since the cost is shared between a large numbers of owners. Every condo common-area and amenity come at a price. Something as simple as a swimming pool can add somewhere around $50 to your monthly maintenance fees. It is a smart financial move to divide the cost of various amenities among multiple owners to make it more pocket-friendly. Such shared amenity spaces are usually better maintained than those of smaller buildings, which is a bonus. If you want more space for your bucks, you should look for an older building. As compared to brand new buildings, those as new as 10 years old promise spacious floor plans, at a lower price per square foot. While the finishes would look a bit outmoded, you can always renovate as per your liking. A condo renovation weighs much lighter on the pockets as compared to refurbishing a house. Rest assured, you won’t find any majorelectrical, plumbing, or structural work required. The cost incurred would include finishing materials such as appliances, tiles, flooring, and other finishing materials. You can always rework an older condo into a striking modern space, and you would still spend less than buying into a new building. Most people convert any large den into an extra bedroom as a smart move to increase the value of their condo. All you have to do is to install a door and a wall and the rather inexpensive renovation would instantly boost the value of your property. For instance, after turning your den into an extra bedroom, you can list your unit as a 3 bed and sell it for way more than if you had listed it as a bedroom plus den in the first place. More and more families are opting in to switch to condo living due to the exorbitant prices of single-family homes. Even if you are living in your condo, you can rent out your extra bedroom for added income. Even tenants are increasingly sharing condos due to the sudden surge in rental prices, and your extra bedroom would facilitate that decision. When looking for Toronto condos for sale, search for those with dens large enough to be turned into makeshift bedrooms. This is a great chance to inexpensively add value to your property. Condo buildings are quickly dominating the skyline of Toronto, and while you may hear some complaining about the new constructions, I think that it is high time to embrace our increasingly vertical city. Since condo ownership has become proliferate, buyers have become extremely choosy about what makes a building stand out.